If you are planning an office move you are also facing the planning of new office space. The structure and arrangement of your office is very important and determine to a greater extent how efficient and productive your staffs will be. If you have not moved before you probably have no idea of how to plan a new office space. If you have had some space planning expertise we are sure you will at least need some advice and a few good tips. This is because the conduciveness of your office space affects output. If your office space is very conducive, then your staff will be very effective during the working hours and also yield maximum output expected of them. Also if you business grow it is good to have some surplus office space to accommodate new employees. But on the contrary, if your office is not well planned and the available space is not maximized, the workplace will not be conducive for your staffs and thus they will not be able to give their best. This is why it is important that you take your office space planning very seriously. Also every time your company grow you will have to find some extra space and as you have not allowed for it this may be a very difficult task. Office space planning requires high level of skills, experience and expertise. It is not something that you can hire any person to do for you. It requires an expert handling because a lot of factors are taken into consideration when an office is being planned. So, when it is time for you to plan your office space or if you want to re-plan your existing office space, you should consider hiring our services. Office Removals have many years of experience in the industry. We have been able to build up a team of dedicated and well trained staffs proficient in planning office space. Our office space planners and designers will apply their experience and expertise while planning your new property for you. Our office space designers utilise consistent process in assessing our clients' office needs. We take into consideration the need of your business and also anticipate future needs when planning your office space. So, you don't have to be planning and re-planning your office space now and then. It is not easy to determine and anticipate the present and future needs of a business respectively. This is an area where we beat many other office space planning businesses hands down. We use a number of strategies to obtain accurate result regarding the needs of your business. Our office interior design experts prepare questionnaires and distribute them to credible personnel and employees in the industry who will give reliable and honest information. But we do not stop at this, we also take a step further by interviewing relevant people including some of your tops clients, employees, management and other people. Our office designers always come up with plenty fresh office space arrangement ideas. If you give us a chance you will have a lot of space design projects and plans to choose from. With this, we will be able to plan your new office space and customise it to meet your requirements so that you can easily accommodate all your new office furniture, equipment, files, employees and still will have some empty space to grow your business. We also take aesthetics into consideration when planning your new property. Having enough space and a conducive workplace is not enough. You need a beautiful and attractive office. 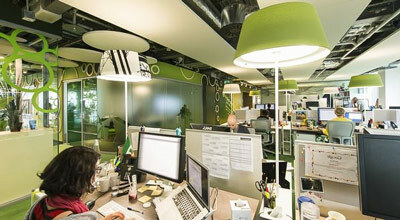 Some businesses today retain and attract new customers because of the visual appeal of their workplace. Our furniture fitters and assemblers will do a perfect set up you new office layout according to our plans. You create first impression about your business and enhance the image of your company before your client by having a stunning office. To help you achieve this, we consider colour harmonies of the entire office decor when planning your office space. We also take into consideration the functional materials as well as the surface materials. The ergonomics, lighting and acoustics aspects of your workplace are also evaluated by our space planning engineers and designers. These factors are overlooked by some office space planners. But they are very important. For example, if the acoustics is not taken care of, the sound from one unit may constitute a serious distraction for the workers in the other units. Our team of office planning professionals are highly friendly. They are good in working as a group. So, they will be able to work with you and any other relevant employees in your office that can give useful information about the needs of your office. Call on us today to plan your office. We guarantee you satisfaction. We know how to plan an office space from scratch!